I don't know about you, but this time of year I barely find time to cook dinner. Cookies, candy, appetizers, yes. So any meal in December that consists of protein and vegetables instead of a handful of cookies is a real treat. 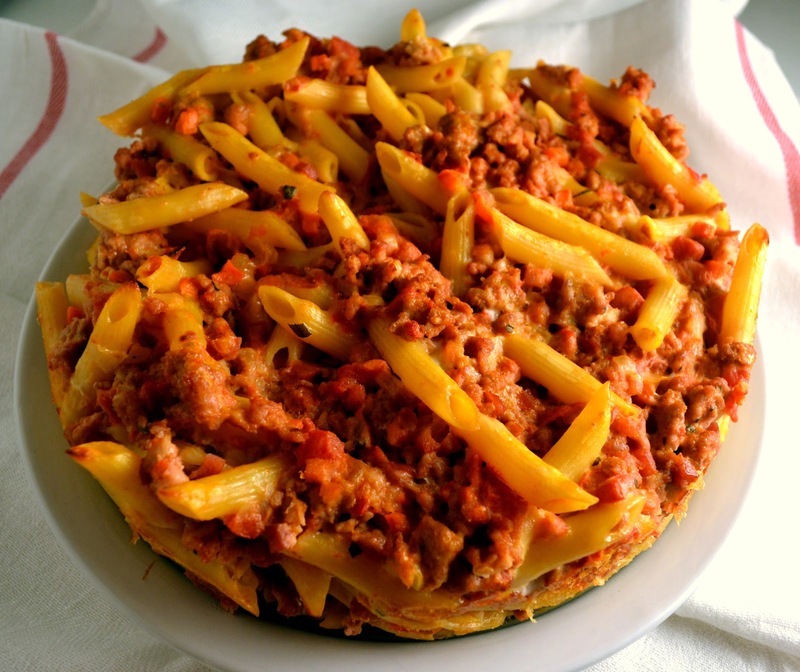 Pasta Bake with Pancetta, Rosemary & Ground Pork not only fit the category of a real meal but was fabulous. Ground pork is an ingredient I use quite a bit so I am always up for trying recipes that feature it. Baked pasta is another favorite at our house but this recipe was just different enough to make it feel special. The flavors of the pancetta and rosemary really come through and the addition of eggs give it an almost quiche like flavor. It was truly delicious and all three of us loved it. I plan on adding some zucchini next time to up the veggie content. Spinach, mushrooms, or cherry tomatoes as called for in the original recipe would also be great. If ground pork isn't your thing you easily use ground beef or turkey or leave it out completely. An easy weeknight meal that is incredibly satisfying isn't always the easiest thing to come by. That makes this one a keeper. In a large skillet, heat 4 tablespoons extra virgin olive oil and saute the onion and carrot until soft, about 5 minutes. Meanwhile, cook the pasta in a large pot of boiling, salted water until al dente. Drain and add to the meat sauce. Stir well and let cool. Break the eggs into the cooled pasta, add the Parmesan, and stir well to combine. Brush the remaining olive oil over the base and sides of an 8 1/2 inch baking dish or springform pan with sides about 2 inches deep. Pour the pasta mixture into the pan and spread evenly. Cook in the preheated oven for about 20 minutes, until crispy and hot. Once cooked, let rest for 5 minutes for easier cutting and serving. Serve warm or cold. I think it needs 40 minutes in the oven, not 20.